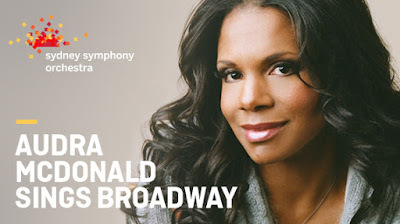 Sydney Symphony Orchestra presents AUDRA MCDONALD SINGS BROADWAY, in the Concert Hall at the Sydney Opera House Nov 5,6,7. Audra McDonald is unparalleled in the breadth and versatility of her artistry as both a singer and an actress. She has won six Tony Awards - CAROUSEL, MASTER CLASS, RAGTIME, A RASIN IN THE SUN, PORGY AND BESS and LADY DAY AT EMERSON'S BAR & GRILL. I have seen her only once before in HENRY IV, with Kevin Kline and Ethan Hawke, in the Beaumont Theatre, Lincoln Centre, New York. When it comes to compiling a concert program such as tonight's, Audra McDonald is careful to strike a balance, drawing on every corner of her diverse repertoire. "I want to give the audience a full, multi-course meal,' she says, 'with a little bit of everything: some comedy, some songs that are very familiar to them, some unfamiliar music, and some old gems.' Above all she says, 'I'm someone who looks for the challenges, whether they come from old or new works. I'm constantly looking for material that scares me, and that will help me grow as an artist. We heard audience familiars such as, I Could Have Danced All Night, from MY FAIR LADY, which she invited us to sing with her, and we did; Climb Ev'ry Mountain, from THE SOUND OF MUSIC, as a rousing, thrilling finale; to the tongue twisting, I Can't Stop Talking About Him, from the film LET'S DANCE; and extraordinarily moving songs, Stars and the Moon, SONGS FOR A NEW WORLD - 1995 - (Jason Robert Brown) and I'll Be Here, ORDINARY DAYS - 2009 - (Adam Gwon); to an hilarious Australian contribution from Kate Miller-Heike (the composer of the Opera Australia's upcoming THE RABBITS), The Facebook Song (2010). The concert was an absorbing two and a half hour joy. Ms McDonald is pure class, an artist of such magnitude that the word STAR is inadequate to describe her presence and performance. Dressed in a sophisticated black full length dress, with pulled-back, tied-back hair, with elegant understated jewellery, simply, she introduced herself, and with disarming warmth and candour spoke to us, personally - as if to each of us, individually - about her world, her families - private and professional - and of the works and her personalised 'contact' for each song she was to sing for us. There is a modesty, an intelligence and a glowing sense of fun, good humour, about her, that she exudes beautifully, and balances powerfully, when it is time, with an immaculate, towering technique in performance. It appears to be effortless and is excitingly, visually connected to the emotions of the story, every sinew and muscle and element of concentration engaged in a purity of skill and talent-gift, bringing to us the primary choice, responsibility, of her task: the 'story' of the lyrics, with an innate, rapturous sensitivity to the music of the orchestra and its part in the telling. Together, under the guidance of Mr Einhorn, the orchestra and soloist share the 'music' with us with consummate empathy. Ms McDonald reaches out to us in a conscious state of affection and touches, opens, a portal to our unconsciousness and reveals to us with her artistry that life is not simply vitality but a dangerous (in the right way) extension of humanity. She seems to give at an incredible 150% commitment. We are alive! Still today, in recall, a week later, that connection to the extraordinary possibilities of a great artist embodied in Audra McDonald, thrills me. I AM ALIVE. What a re-awakening, eh? I remembered my experience years ago in San Francisco when I was equally thrilled by Lena Horne and her concert performance: THE LADY AND HER MUSIC. BOTH INCREDIBLE NIGHTS - I hope the Sydney Music Theatre World went to see this great artist, for it was a Masterclass of performance not to be missed. Hearing Ms McDonald sing "Summertime" (in the final of her Opera House concerts) was a transcendently beautiful experience...it was as if everything with the usual power to distract had faded into oblivion, and one was transported by some irresistible power to a place of magical languor, rapture, sadness and hope. When it was over, I wished she would just... sing it again. She didn't, but - as you say, Kevin - continued with a programme that conveyed the breadth of her talent, experience, passions and commitments, nearly everything introduced with an anecdote about how the songs - and let let it be noted! - their composers and in some cases original performers - came to claim a piece of her heart. How lucky was anyone who was there to hear this marvellous singer-actress.